I'm Curious Too: How Big Are The Craters In This Picture? What is the size of the craters in this picture? And if we have a crater that size on Earth, how big would it be? The moon has craters on its surface --lots of them-- and some are huge and some are small. These craters are the results of the collision between the moon and other smaller celestial bodies such as asteroids, comets or meteorites. Unlike the Earth which has a layer of atmosphere to burn incoming foreign objects, the moon has no atmosphere to help shielding it from even the smallest of meteorites. Okay now let's get to the questions. I've decided to make this post into some kind of Q-and-A style. So grab your pen and paper and let's get started! First, we need to know the diameter of the moon and the diameter of the Earth. 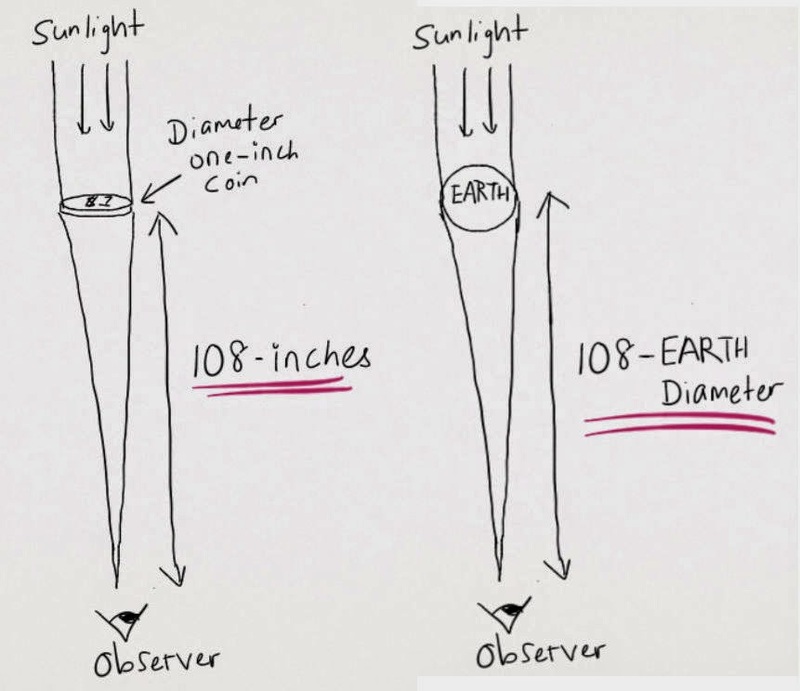 Q: So how can we know the diameter of the Earth? A: Well, you can do it the easy way by asking your best friend Google, or you can try to justify your college degree by doing it on paper, because the Greek had it figured out--without calculator, computer nor Google--in 230 BC. Okay so you don't know how. Repeat this after me: I'm just an idiot with access to a microwave. Erathosthenes, the Greek who invented the word and science for Geography looked into a well one afternoon and observed that the sun's reflection cast a perfect circle at the bottom. At the same time and on the same day the next year, he went to a location several hundred miles away and looked into another well, and observed that the sun's reflection didn't cast a perfect sphere at at the bottom. So (C / D) = 360 / θ. According to the Greek astronomer Cleomedes, Eratosthenes measured θ to be 7.2 degrees, and the distance D between the two wells was 5000 stades (1 stade = 520 feet). From there you can get the radius of the Earth to be 6,319 km, and the diameter of the Earth to be 12,638 km*. Q: What is the diameter of the...hey wait. How do they know the diameter of the moon since it's so far away from Earth? And by the way how do they measure the distance of the moon from the Earth? A: This is a little trickier. You need to observe the lunar eclipse to solve this. And again, it was the Greek who solved it. 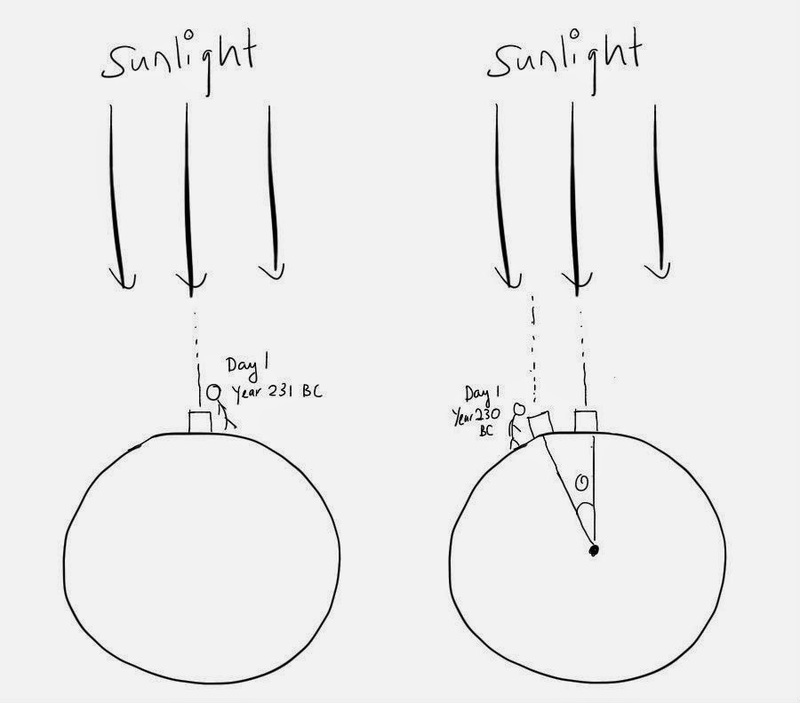 The Greek observed that when you hold up a one-inch coin to try to block the sun, you need to place it at 108-inches away; any closer and you'll block out all the sunlight, and any further you'll not be able to block out some of the light. And if you repeat it with a two-inches coin, you'll have to place it at 2 x 108 = 216-inches away. Awesome observation skill by the way. Applying this logic means when the Earth casts a shadow, the shadow will be 108-Earth-diameter-long. So using the diameter of the Earth 12,638 km, we can calculate that the shadow of the Earth in space extends to 12,638 x 108 = 1,364,904 km away. We can construct three triangles from the figure above. 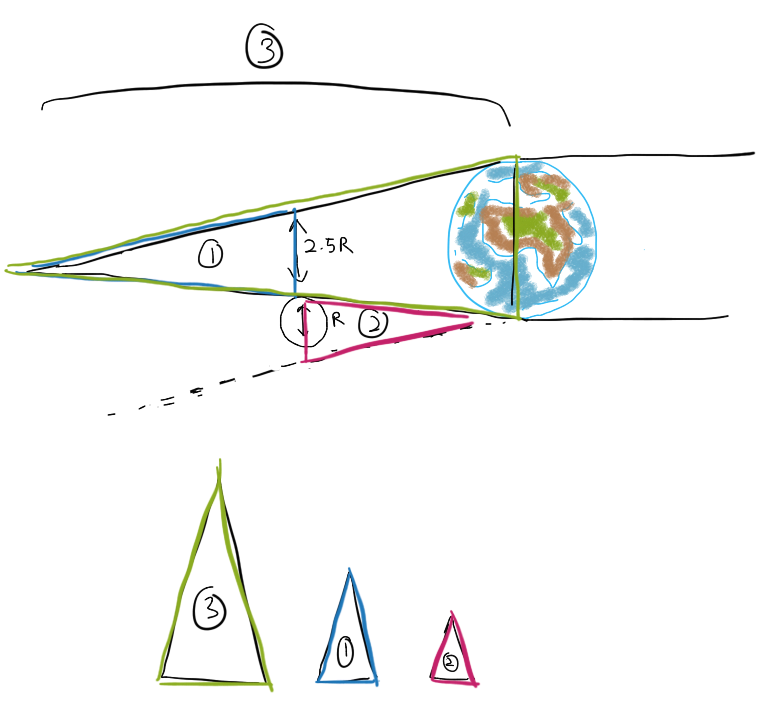 For triangle 3, we know the base is the diameter of Earth i.e. 12,638 km, and the height is 108-Earth-diameter long i.e. 1,364,904 km. For triangle 1, we know that the base is 2.5 times the base of triangle 2, and it's height is also 2.5 times the height of triangle 2. But the height of triangle 1 + triangle 2 = triangle 3. Hence, to get the height of triangle 2, you just have to divide the height of triangle 3 by 3.5 i.e. 1,364,904 / 3.5= 389,972.57 km*. 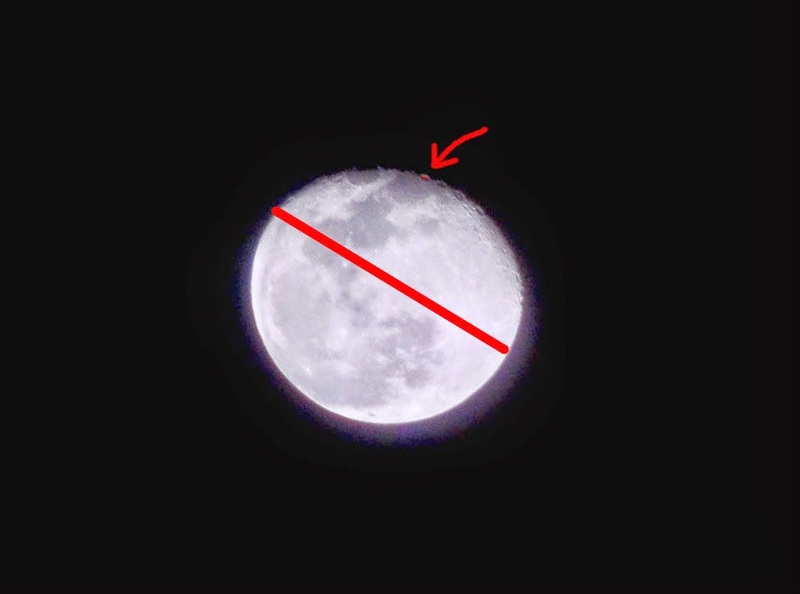 Also we can get the diameter of the moon by dividing the base of triangle 3 by 3.5 i.e. 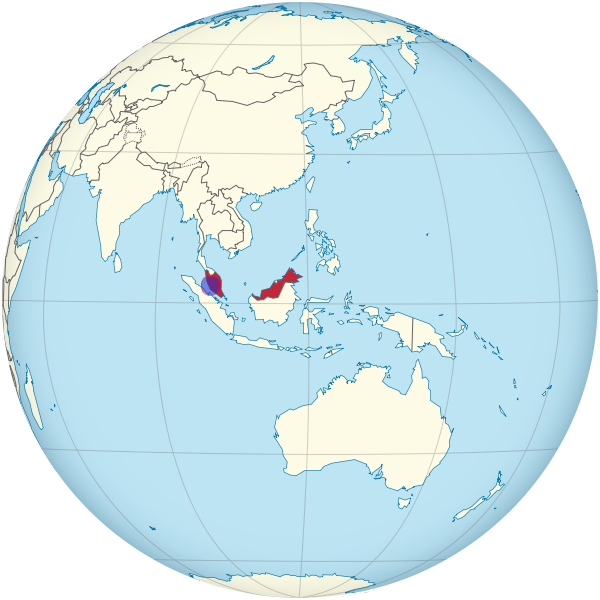 12,638 / 3.5 = 3,610.86 km*. Q: Ughh I'm getting lost here. Can we get to the size of the craters now? A: Well, yes. But you need to get the surface area of the moon first. Q: And how do I get that? A: Just a quick A = 4(pi)(r*r). That would give you A=37,932,328.1 km2. And that's very close to the figure given by Google, which is 37.9 million square kilometers. Q: Right, smartie, please give me the surface area of the crater now. A: Umm.. Firstly, we need to pick a crater. There are a few here, so I'll just pick any random one. 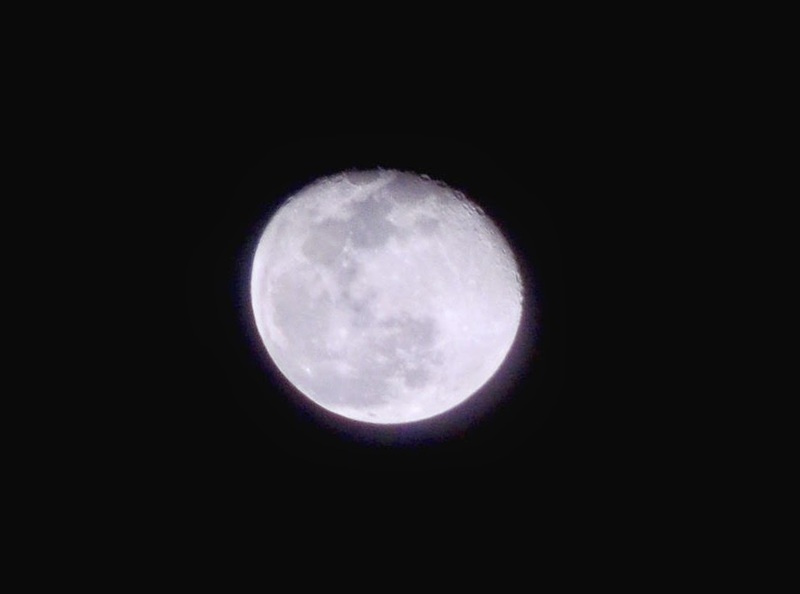 Then we need the ratio of the diameter of the moon to the diameter of the crater. You can do that easily by using a ruler, and I got 26.11 : 1. Then you can proceed to gauge the diameter of the crater by dividing 3,610.86 by 26.11. The diameter of the crater in the picture = 3,610.86 / 26.11 = 138.28 km! A quick check from here reveals that the crater is Langrenus and its official diameter is 132 km. Q: And in Earth's term? 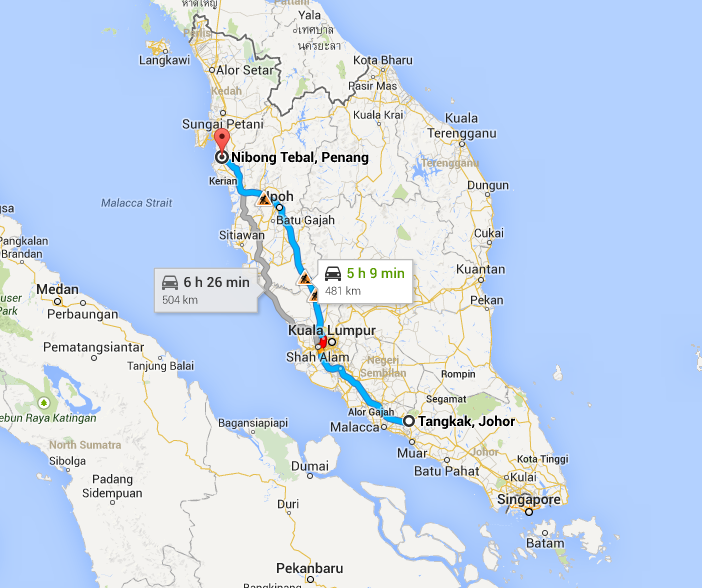 A: (138.28 / 3,610.86) x 12,638 km = 483.98 km! 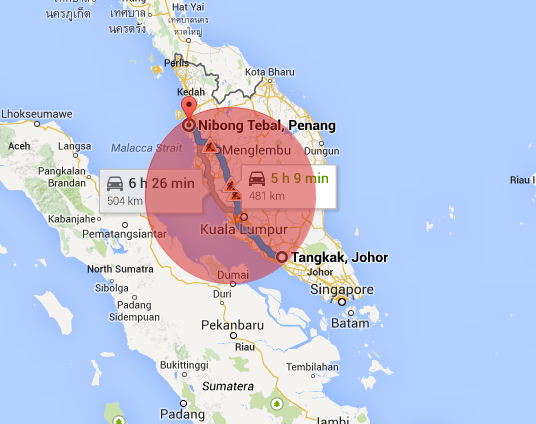 That's the distance from Nibong Tebal to Tangkak, Johor! Q: If we have a crater that size on Earth, how big would it be?. A = (pi)(radius * radius) = 183,969.02 km2. It'll form a huge area, definitely noticeable even on a global term. And that, my friend, is the size of the crater you see in the picture.